Long ago it was thought that the arts could make life better… possibly for the many, but at least for the few. That was then… The quaint notion came to mind on a recent visit to Los Angeles where art is often a visible part of public life along with homelessness, traffic, and donut shops. By contrast with New York where the visual arts are mostly sequestered behind the doors of galleries and museums (and the equally large homeless population is far less visible by being scattered through the five boroughs), Los Angeles is alive with public art, installations of several sorts, and museums with inviting plazas, restaurants, and music. At LACMA, the Los Angeles County Museum of Art, families can eat out of doors even in cool weather, listen to music, and have access to the galleries though admission is not free. I was happy to see that those who do not want twelve dollar pizzas, paninis and California wine at the LACMA cafe, can spread out blankets nearby and enjoy the scene with their kids, dogs, and food. This strikes a New Yorker as almost impossibly utopian. For a more considered view of all that has happened to arts in the city than I can give I sent some questions to the Los Angeles Times art critic, Christopher Knight. EP: To a New Yorker out there on a visit Los Angeles, particularly its downtown, seems like a newly minted boomtown for the art of the present moment. Whether this is an altogether accurate impression or not, can you describe the evolution of the city’s museum and gallery scene during the four decades or so that you have been a part of it? CK: Actually downtown L.A., today’s “newly minted boomtown” for the art of the present moment, is newly re-minted. When I first came to Southern California in the late 1970s, galleries were scattered, but almost all of them were west of Hollywood. I started writing in the 1980s, and downtown was just beginning to coalesce into a thriving gallery neighborhood with a couple dozen venues. (Today there are a couple hundred around the city.) Artists had lived there for a long time, given the usual reasons of plentiful cheap space in otherwise undesirable neighborhoods, but galleries began to move in for one primary reason: The new Museum of Contemporary Art was on the drawing board, and its Temporary Contemporary was opening in a refurbished warehouse in nearby Little Tokyo. All that came to a crashing end circa 1990 with the economic collapse. Since then galleries have been quite peripatetic, clustering for warmth first in West Hollywood and Santa Monica, then Chinatown and Culver City and more recently Mid-Wilshire, Hollywood and downtown. As a gallerist once told me, they seem to do best in service areas adjacent to wealthy residential areas – the neighborhoods where you find the dry cleaner, the pet store, the art gallery. Convenience, in other words. (Which also means parking.) And as L.A. becomes less suburban and more urban, slowing traffic, getting around to see things gets more difficult. The distance between galleries I go to in Venice Beach and downtown is farther than the distance between Manhattan and Newark, New Jersey. There have been two larger gallery changes, aside from huge numerical growth. One is that the entire scene’s center of gravity has shifted eastward, after starting out fifty years ago in the city’s western reaches. (It’s a real estate thing.) The other is that several New York and European galleries have opened branches here, for a variety of reasons (not just servicing their collectors, but servicing their artists). Interestingly enough, the nation’s first truly bi-coastal space, Virginia Dwan Gallery, started here in 1959 and then opened a New York branch in 1967. Now the gallery traffic goes the other way. 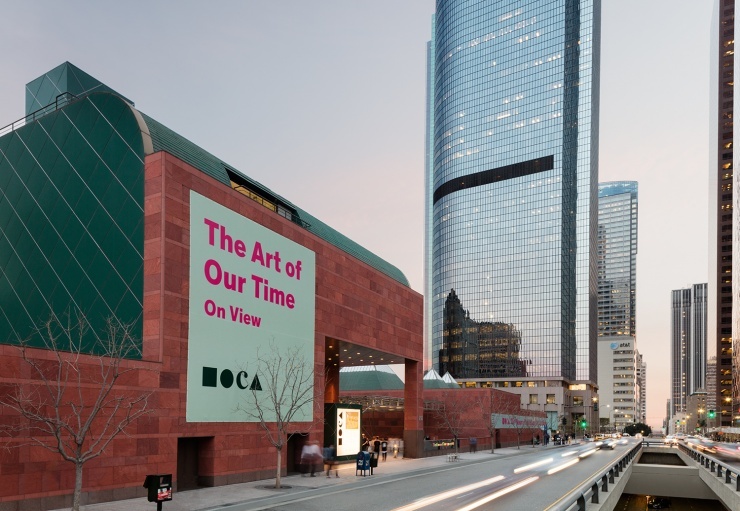 As for museums, two of the most active and worthwhile exhibition venues – the Getty and the Hammer – didn’t exist when I started out, nor did MOCA (the Museum of Contemporary Art), which still hasn’t gotten back its mojo four years after its chaotic troubles wound down. (The Broad and the brand-new Marciano Foundation aren’t really museums, just private collections gone public, and the kunsthalles – the former Santa Monica Museum, soon to be the ICA/LA, and the Pasadena Museum of California Art are hit or miss.) LACMA, once stodgy and establishment, is now sometimes too star-struck, but it does have a steady roster of impressive shows, large and small. The general newness of most of these museums has obscured something pretty remarkable: Their collections are, in general, far better than they are usually given credit for. The best one, picture for picture, sculpture for sculpture, is probably at the Norton Simon Museum, while the most under-utilized asset is surely the Huntington. Which is odd, since the Huntington actually predates most of the others. My biggest pet peeve: A breathtaking museum collection composed solely of art made in Los Angeles since 1950 could be built, yet there is still nowhere on the planet to go to get a sense of how significant the city’s artists have been and what trajectories its art has taken. I’m not saying there should be such a museum, only that the exceptional quality of L.A.’s art is perennially hidden under a bushel. EP: The boundary between art and commerce in New York has become a highly permeable one. Is something like that happening in the galleries and museums of Los Angeles? Is it necessarily a bad thing? CK: The boundary between art and commerce is probably always permeable – especially in New York, since it’s the center of the international art market, which casts a very long, deep shadow. Recession in the 1970s had taken a toll on L.A.’s galleries when I first arrived, and it wasn’t difficult then to see virtually every gallery in a day, or maybe two if you wanted to stop for lunch. Now it’s impossible to do it in a week or two, even if you fast. The money thing is having regrettable impacts on museums. Last week I got a breathless press announcement about a local museum curator who had snagged a European junket sponsored by a powerhouse gallery, as if this was wonderful news rather than baldly corrupt. A few weeks earlier, another release announced that an art dealer had joined that museum’s board of trustees – and wasn’t that just grand? Uh, no, it’s a conflict of interest. Los Angeles has the dubious distinction of being the first American city to have a major museum hire a prominent gallery owner as director. That the plan turned out to be a crash-and-burn fiasco was hardly a surprise. I would also include the tourist economy in art’s commercial equation, at least as far as museums are concerned. Art museum tourism is now a defining characteristic of a culture capital. If you don’t have it, you’re not one. From afar, New York’s museums seem increasingly tied to the tourist trade, for good and ill. The Getty is L.A.’s first (and still only) art museum as international tourist destination – though busy hands are hard at work trying to expand that number, again for good and for ill. The Getty’s saving grace is its wealth – and the resulting absence of an admission charge, which provides a measure of freedom from having to program for people who have no interest in art. In fact, it’s worth noting that both the Getty and the Hammer, plus the Broad and the Marciano, are free. That’s a trend to get behind. I did ask Christopher one other question: What sort of visibility do the arts of the past have in the city just now? Do you see viable uses or regrettable misuses of the past in exhibitions around town? That he did not answer this one suggests that it is time for me to stop whining about the invisibility of older art and get back to covering its lingering presence. Next time.